Nissan’s new half-ton version of the “heavy half-ton” Titan XD leaves off the “XD” suffix to become, simply, the Titan. Initially offered only as a crew cab with either rear- or 4-wheel drive, it’s due to get regular-cab versions later in the year. Current prices start at just under $36,000. Big pickups have long accounted for big sales numbers, but little of that volume can be credited to Nissan. Based on the company’s early and substantial success with compact pickups, it probably only seemed logical that a bigger one would fare the same. So it was that for 2004 Nissan brought out the full-size Titan, which was built at a new factory in Canton, Mississippi. You know, right here in the good ol’ U.S of A. When Nissan introduced the Titan, it was offered in half-ton extended-cab and crew-cab body styles, the former noteworthy for having rear-hinged rear doors that opened roughly 170 degrees – much farther than those of its competitors – enough so that they sat flush against the side of the cargo bed. This made it much easier to access the rear seat in parking lots. 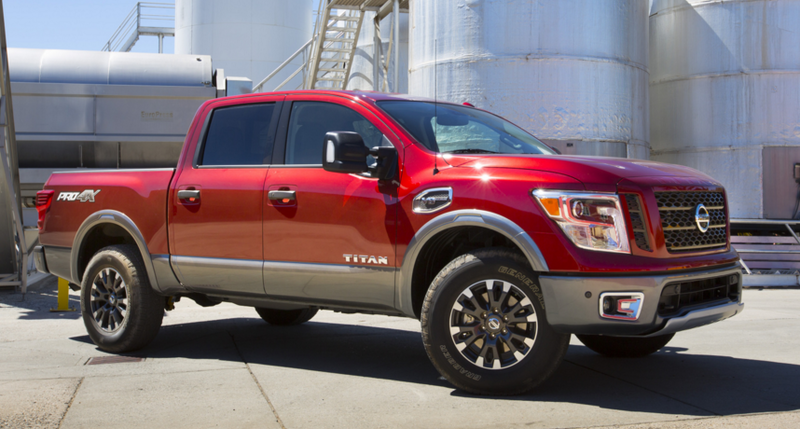 At first, the Titan will come standard with a potent 390-horsepower 5.6-liter V8, but a V6 is due to be offered later. But despite that – and the fact it came standard with a fairly powerful V8 engine – Titan sales proved underwhelming. Rack it up largely to the fact that American full-size truck buyers were steadfastly loyal to American brands – kind of the last bastion of such nationalistic pride – something Toyota was also finding out the hard way with its equally slow-selling Tundra. It’s also possible that the lack of a regular-cab offering may have hurt Nissan a bit, as these were often used as commercial vehicles, largely due to their lower price and more maneuverable length. Yet having a regular cab didn’t seem to be helping Toyota all that much. Since then, while its domestic rivals were playing leap frog with each other over redesigns, the Titan remained pretty much as it had been since 2004. Then, last year, a new truck finally hit the auto-show circuit – and shortly thereafter, Nissan showrooms. But this was a truck of a slightly different color. Called the Titan XD, it was sort of a “heavy half-ton” that was the first in its class to offer a turbodiesel V8 engine. It came only in a crew-cab body style, which had since become the dominant choice of consumers. 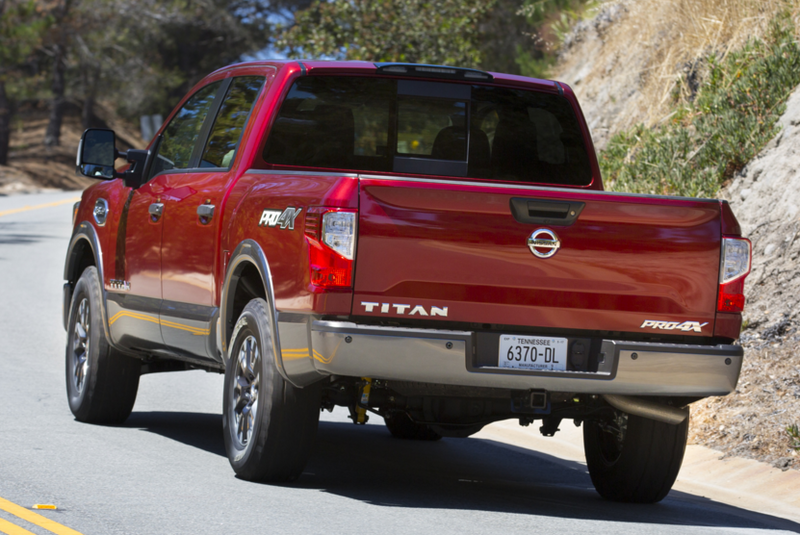 For 2017, Nissan follows the Titan XD with the “just plain ol’” Titan, along with the truck’s first regular-cab body style – and later, its first V6 engine. The tested top-line Platinum Reserve comes with rich interior appointments and a host of luxury features. For now, the standard engine in the new Titan is the same 5.6-liter V8 offered in the XD (where it’s also standard, with the turbodiesel being optional), which – through many internal improvements – has been boosted from its original 317 horsepower to a lofty 390. 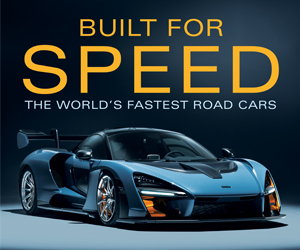 With that has also come some substantial fuel-economy improvements, in part thanks to aerodynamic tweaks and a 7-speed automatic transmission that replaces a 5-speed. EPA figures for 2WD versions are up a substantial 3-4 mpg (or about 28 percent) over those of the previous Titan, jumping from 12 city/17 highway/14 combined to 15/21/18. Initially, the half-ton Titan will be offered only as a crew-cab in five trim levels: S, SV, SL, off-road-oriented PRO-4X, and luxury-themed Platinum Reserve. Due later in the year are regular-cab and King Cab (extended cab) versions, along with the aforementioned V6 engine. 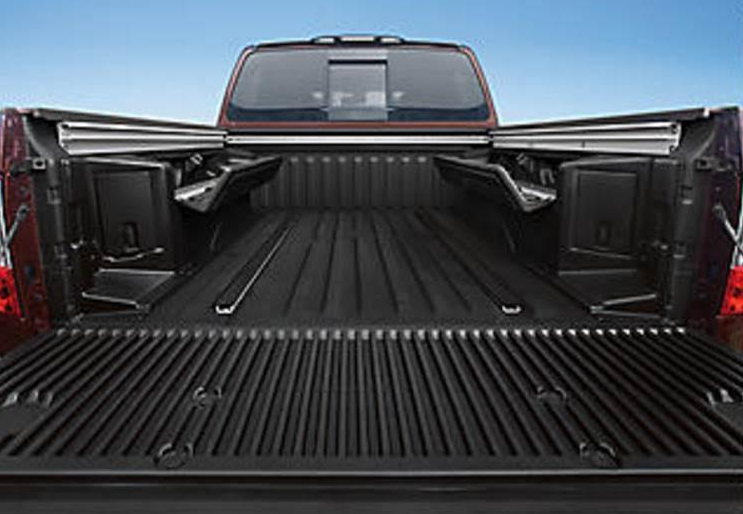 The half-ton Titan crew cab is a foot shorter in wheelbase and overall length than the heavy-duty Titan XD, all attributable to having a 5.5-foot cargo bed rather than a 6.5 footer. Prices are also lower by about $1500 to $2000 depending on model, with the base 2WD Titan S crew cab starting at $35,975 including destination, and a mid-level 4WD SL coming in at $50,655. Maximum payload and towing capacities for the ½-ton crew cab are 1610 lbs. and 9390 lbs., respectively, while those for the Titan XD crew cab are 2590 lbs. and 12,314 lbs. Also newsworthy is that all 2017 Titans – heavy-duty XD and new half-ton models – will be covered by an industry-leading bumper-to-bumper warranty of 5 years/100,000 miles, and it applies for both personal and commercial use. 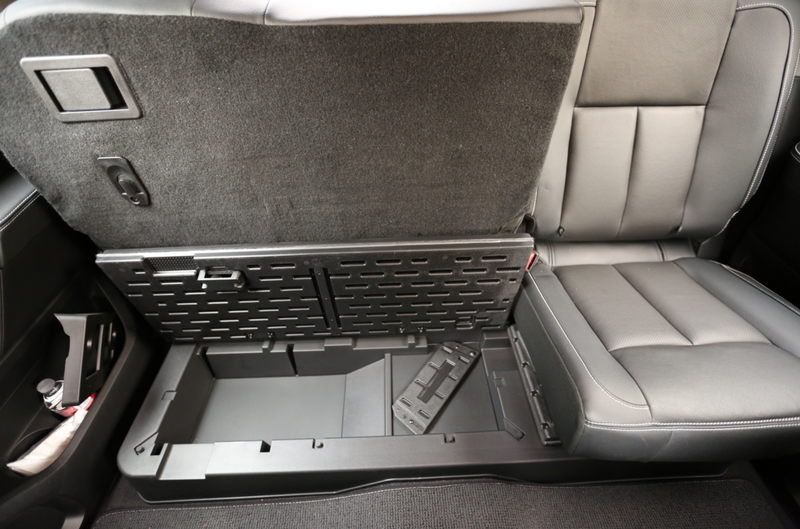 The rear seat cushion flips up to reveal a handy under-seat storage compartment. 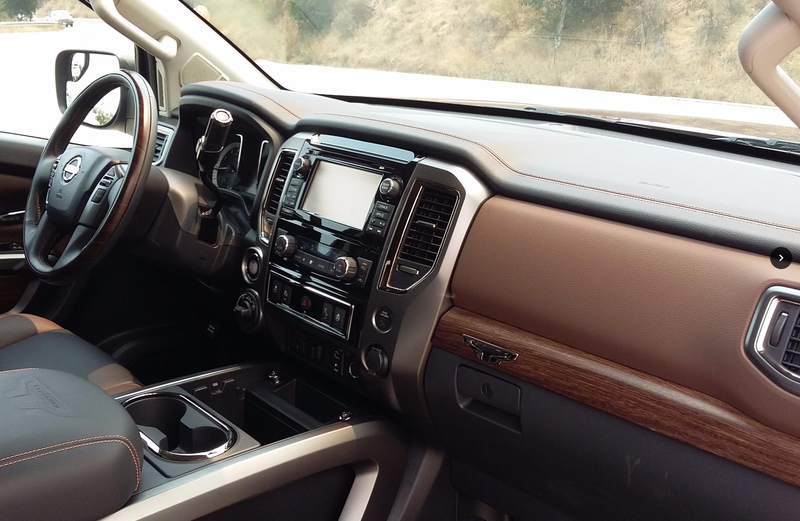 Notable features offered on the new half-ton Titan include LED headlights and taillights, 2nd-row under-seat storage, 110-volt outlet, puddle lamps, a rear-bumper step, damped tailgate, rails on both the sides and floor of the cargo bed, LED cargo-bed lights, and lockable/removable bed-wall boxes. Available comfort/convenience features include dual-zone automatic climate control, remote start, heated and cooled front seats, heated rear seats, and heated steering wheel. There’s also a rearview camera and Around View (360-degree) Monitor, along with front and rear obstacle detection, blind-spot alert, and NissanConnect Services that provides emergency response, navigation services, and remote access to your vehicle. Those interested in towing will appreciate the available integrated trailer brake control, downhill speed control, and trailer sway control. Titan fares well on the road. The V8 provides strong acceleration, and the transmission kicks down quickly when the throttle is pressed. We didn’t encounter many real bumps on our California test route, but the ride seemed impressively comfortable, with less reverberation over bumps than is the pickup norm. Handling was likewise impressive, as was insulation from engine, wind, and road noise. We tested a top-line Platinum Reserve. It was nicely trimmed inside with rich-looking materials, the only surprising lapse being that the door tops weren’t padded. Shown are the lockable, removable bed-wall cargo boxes that will be offered shortly after launch, along with the side and floor rails for tie-down hooks. Oddly, the front seats don’t go back as far back as might be expected, so really tall drivers may wish for more legroom, but headroom won’t likely be a problem. Step-in is moderately high, but it’s higher in back, where passengers will find ample space. The rear seat cushion flips up to reveal a large under-seat storage area, and a panel flips out to make for a level floor. Front-seat storage includes a good-size glovebox, large forward console bin with movable cupholders, another smaller console bin, a huge console box with internal tray and 12-volt plug, and large map pockets with cupholders. The infotainment system includes volume and tuning knobs, with other functions left to a large, easy-to-reach dashboard touch screen. Climate controls consist of a rotary temperature knob, but less-convenient repetitive-step pushbuttons for fan speed and mode. Visibility is mediocre to the front corners due to thickish roof pillars. Those on the sides are much worse, blocking a lot of your over-the-shoulder view, though they’re set far back and the sideview mirror includes a wide-angle lens. View to the rear corners is quite good, aided by a rearview camera and available 360-degree Around View Monitor. Although pickups are less about hauling cargo than they used to be, that didn’t stop Nissan from offering some really neat features for the bed. A fold-down rear-bumper step is also available. Available are a fold-down bumper step and damped tailgate with assisted lift. Also offered are rails in both the sides of the bed and the floor that hold moveable tie-down hooks; those on the floor are particularly useful if you’re strapping down a motorcycle. 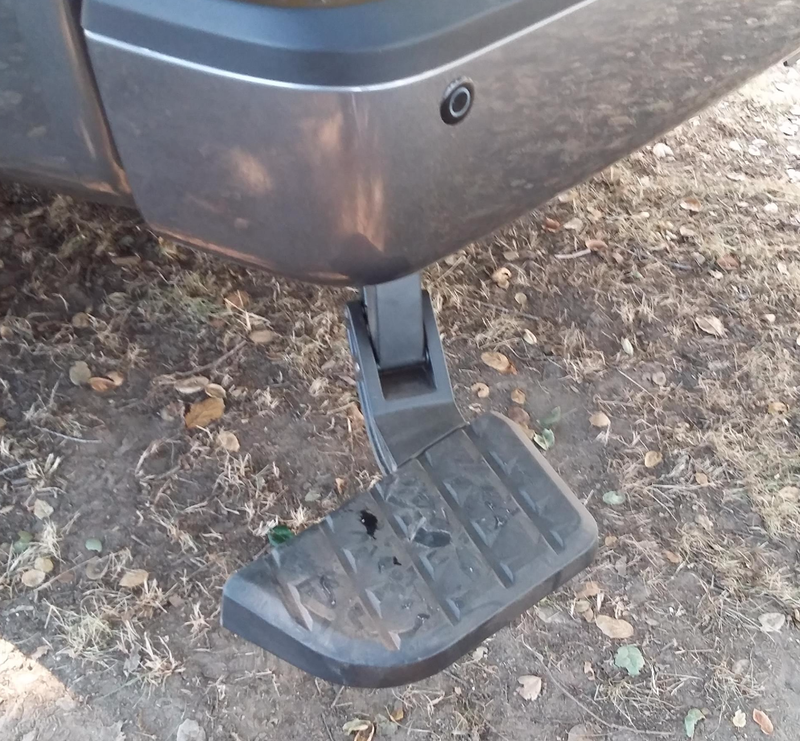 There are also bed lights under the side rails that include some at the far back that shine directly on the tailgate – really nice if you’re carrying a tall load that would otherwise leave the tailgate in the dark. And available shortly after launch are large, lockable, removable cargo boxes that set against the sidewalls of the bed over the wheelwells. Since its introduction, Titan has had a tough row to hoe. And with little in the way of updates over the past dozen years, its mission hasn’t gotten any easier. But with this redesign, the Titan has finally been brought up to snuff with the best the class has to offer, which may leave Nissan with a much bigger piece of the full-size pickup pie. Both the regular-cab body style and V6 engine due later this year are “firsts” for Nissan’s big pickup. Written by: Rick Cotta on August 17, 2016. What is the Silverado High Country?